Perhaps the forth time is the charm, in Oak Interactive’s fourth straight year of entering, the AAF – Houston 51st Annual ADDY Award Show, the Company was recognized with another Gold ADDY. 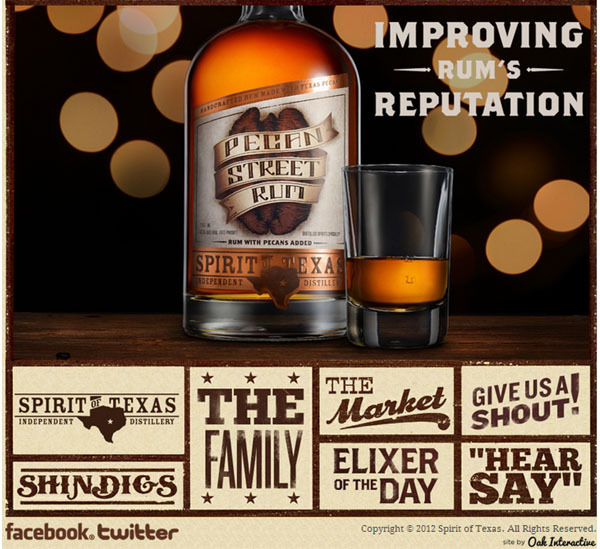 It was on February 2, 2013 when the Company received a Gold ADDY Award, for their Spirit of Texas website. The site was developed for Spirit of Texas a Pflugerville, TX. independent rum distillery. The AAF – Houston ADDY Award Show represents advertising from the entire Houston area. The Houston-based Advertising Company also received recognition with a Silver ADDY for their work on a website created for BB’s Honey, an Alabama based honey company, known for harvesting honey naturally from hives. “It’s always nice to be recognized. We try to do something new with each project,” Oak Interactive Creative Director Daniel Szymanowski said, “Winning an ADDY adds a bit more fire to the flame.” The Company walked away with additional recognition for their newly created Company website, which they launched earlier in the year. The site is completely responsive in design, allowing the integrity of the site to remain intact when viewed on desktop, tablet, or mobile a device. The Advertising Company accepted the awards on behalf of Founder & CEO Moses Robles, Partner VP, Brand Management David Malamud, Creative Director Daniel Szymanowski, Art Director Jori Thompson, former Creative Director Jeff Long, Account Executive Dominic Dames, Ad Operations Manager Gabriela Campos and Search Marketing Specialist Griffin Long.